Iraq is pumping more oil than ever before, even as ISIS-fueled chaos grips parts of the Middle Eastern country. That's up by 100,000 barrels a day from April and helps fill the void left by big outages in Nigeria and Canada. It's also about 2 million barrels a day more than what Iraq was pumping before the 2003 U.S. invasion. 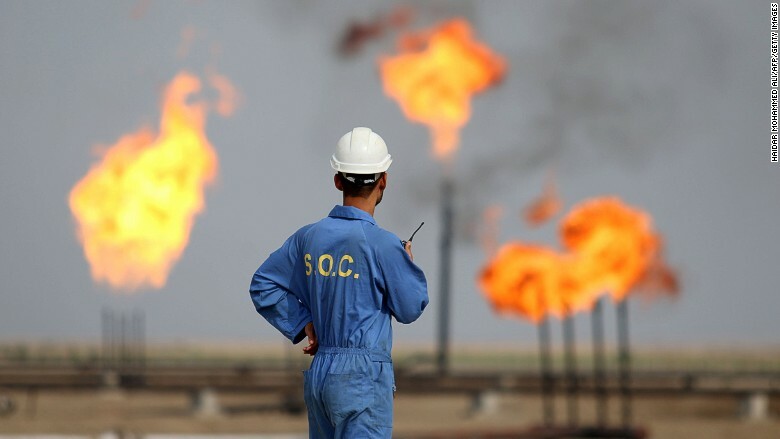 "Iraq has been quite successful at ramping up production, despite all of the political and security issues going on," said Julius Walker, senior consultant at JBC Energy. Much of that oil is flowing into the U.S. Iraqi oil imports to the U.S. have tripled since January and now stand at the highest level since July 2014, according to ClipperData. The milestones comes even as tales of horror emerge from Falluja, the ISIS stronghold located in the center of Iraq away from key oil facilities. The United Nations estimates as many as 50,000 residents are caught in the crossfire in Falluja as the U.S.-backed Iraqi military attempts to oust the terror group. 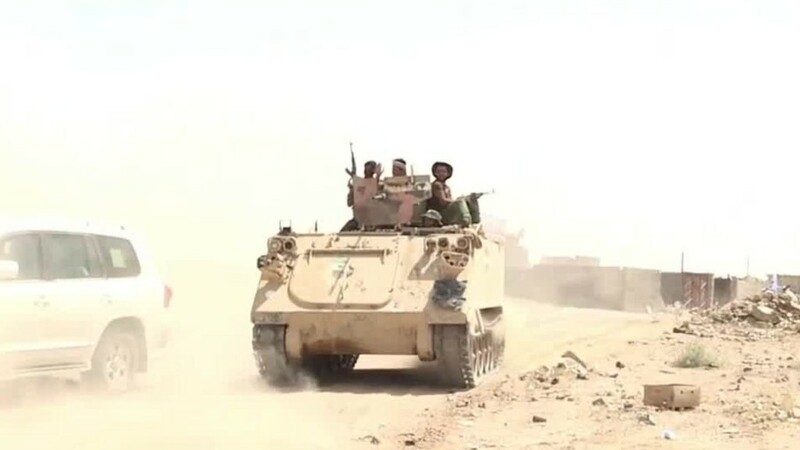 Reports indicate children in Falluja have been killed by bombs, people are forced to eat garbage to stay alive and ISIS is shooting civilians who try to flee. In recent weeks, the political crisis and security situation in Iraq has worsened. "With the potential for political temperatures to rise this summer, the government has already reinforced security around southern oil facilities," Helima Croft, head of commodity strategy at RBC Capital Markets, wrote in a recent report. Of course, the Iraqi military's advance on Falluja wouldn't be possible without oil revenue, which according to the IMF made up 94% of Iraq's 2014 federal revenue. These days, oil makes up 99% of Iraq's exports and about 90% of all federal revenue, according to the Brookings Institute. "Every barrel helps. 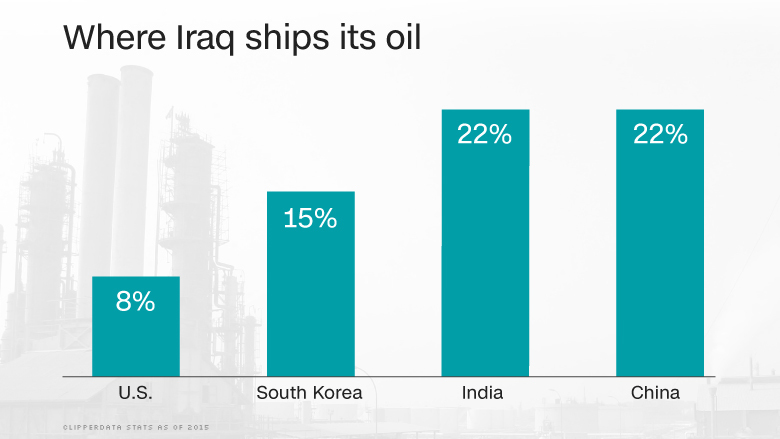 There isn't a whole lot going on in Iraq other than oil. They are highly dependent," said Mike Wittner, global head of oil research at Societe Generale. It's sort of a Catch-22 situation for Iraq. Not only does the country need to sell a ton of oil to pay for its defense budget, but it needs robust security to protect its golden goose: oil revenue. "Oil is financing everything, including their security forces. One depends on the other," Wittner said. Like Saudi Arabia and other Middle Eastern countries, Iraq's finances have been hurt by the steep decline in oil prices over the past two years. An Iraqi laborer at an oil refinery in the town of Nasiriyah, which is located along the Euphrates River and is south of Baghdad. Iraq's oil apparatus has held up reasonably well lately after suffering from sabotage last year. Analysts said there are no current reports of major production outages caused by security issues. That's because much of Iraq's oil facilities are clustered in the southern part of the country away from much of the fighting. However, Iraq's oil production has been hurt by other issues. The biggest is an ongoing payments dispute between Baghdad and the semi-autonomous Kurdistan Regional Government over how to split up oil revenue. Societe Generale estimates that is hurting Iraq's oil production by about 100,000 to 150,000 barrels per day. Iraq's oil output is also subject to the whims of the shaky power grid and rolling blackouts that still impact daily life there. "It's striking that 13 years after the 2003 invasion Iraq still faces severe power cuts for large parts of the day. That's still not resolved even though it's one of the basic things the government should want to do to keep the population happy," said Wittner. The power headaches highlight the long-term challenge facing Baghdad. The country needs to attract investment from foreign oil companies to maintain aging oil fields and search for new ones. Yet the humanitarian crisis in Falluja and more basic problems like rolling blackouts make that difficult. "Iraq continues to face headwinds in terms of stability. If there was greater stability and more investment into the country they could increase production volumes," said Matt Smith, director of commodity research at ClipperData.